I got home from work over three hours ago. My poor little trotters still haven't thawed out. Even sitting 'neath the Slanket of Dreams (tm) for the last hour hasn't helped. 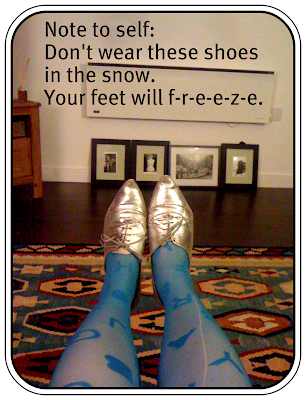 Pointy silver shoes may make you feel like a joyous little elf, Helen, but they are not suitable for a snowy day in February. Silly girl. Also, is it ok to still wear my Henry Holland alphabet tights despite the humungous ladder blighting the same? No? Thought not. £11 well spent there. Marvellous.